So I’m curious as to whether or not anyone here thinks I’ve missed any. Thanks. I've been collecting old books myself. Sometimes a person gets lucky and get one in almost, like new condition that even smell really old. As of today, I finished obtaining all the books on that list of mine, and it appears no one has anything to add. I know the feeling of getting a really sweet copy of an old book. I've got a few thirties books (Curran and Kauffeld, Ditmars, Pope, etc.) that still even have great dust jackets. Even got a signed 1931 copy of "Snakes of the World" by Ditmars that arrived today (no dust jacket, though) - cost me $10! There are good deals out there for the oldies. I have a huge herp book library. I also have some really nice old books. On a few I had the binding repaired by the local library. They did a great job on most of them to the point you can't really tell they're redone. I guess I don't have a wish list but I do like seeing notes in the old field guides. Justin: I recently got a copy of Ditmars' The Reptile Book. It's a 1907 book, and the cover is completely separated from the pages. I'd planned on looking up how to repair it myself, but would it be better to take it to the library? The Real Snake Man wrote: Justin: I recently got a copy of Ditmars' The Reptile Book. It's a 1907 book, and the cover is completely separated from the pages. I'd planned on looking up how to repair it myself, but would it be better to take it to the library? My good friend has a Masters in Library Science and runs a very nice and modern local library. He has done a few old books for me. One Ditmars is on a wooden binding. The hardback is wood! He had the book so long I had forgotten I owned it. The cover is a bit worn, and faded but the binding is just great now. It can't hurt to ask your local library if they offer this service or can help you out with getting it done. I don't know what it would cost, I was only charged beer and dinner. Oh, you're like the only person I know as nerdy as I am about books. I finally found a copy of http://www.amazon.com/monograph-colubri ... 8090169988 that wasn't too expensive and in good shape. I should have it this week! Only a few more books needed to make me feel complete now. justinm wrote: Oh, you're like the only person I know as nerdy as I am about books. I finally found a copy of http://www.amazon.com/monograph-colubri ... 8090169988 that wasn't too expensive and in good shape. I should have it this week! Only a few more books needed to make me feel complete now. Nice! After getting really into books in the last 12 months, and acquiring >100 books in that period of time, I've decided it's time to slow it down a bit. That book is on my wishlist, but it'll be a while before I get around to getting it. By the end of next year, my wish list of books published in prior years (because I tend to buy all the new stuff that I want) should be down to about fifteen books, and that'll be one of them. I envy you, but you've probably been at this longer than I have. justinm wrote: Only a few more books needed to make me feel complete now. Chris, there's this epic chameleon book that I don't know the name of, off the top of my head. I've seen it going for over a grand and never under 600 in bad shape. I think Chip Cochran owns it, he's the only person I know who has a copy. I would throw you in traffic for that book to be on my shelf. Can any of you help me? 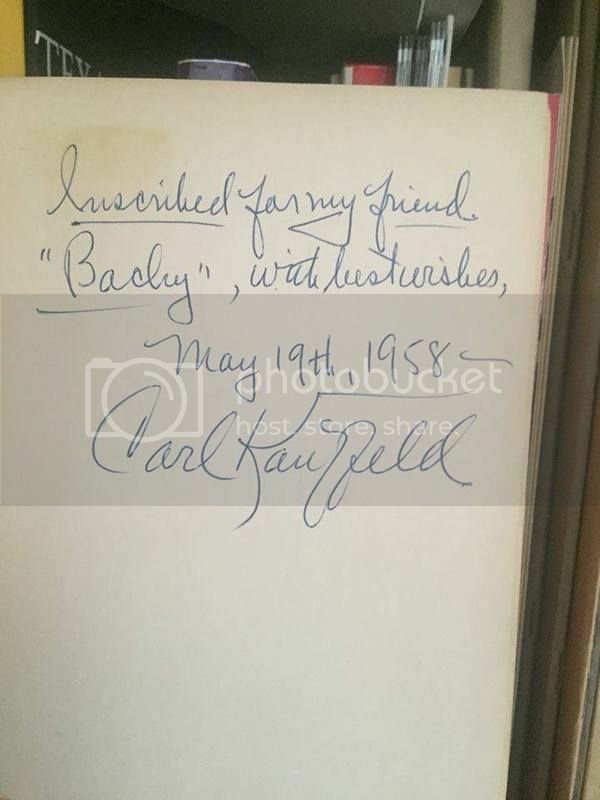 I was about to sell my autographed copy of Carl Kauffeld's "Snakes: The Keeper and the Kept". It was published in 1969, but I noticed the signature is dated Jan. 19, 1969 (it could be "Jun. ", but I think he would've spelled out June). 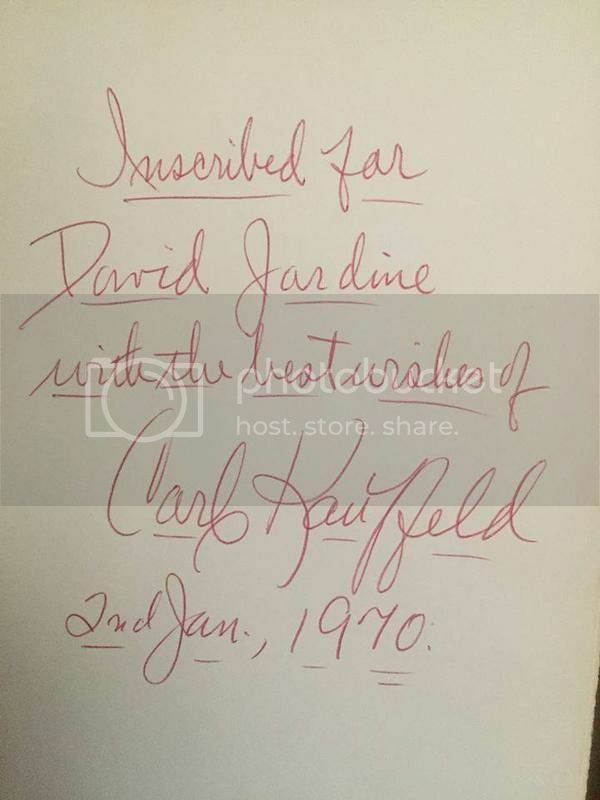 Does anyone have a Kauffeld-signed book, and can you post an image so I can compare signatures? Thanks! Here are a couple of examples from the Facebook Classic Herp Literature Group. He apparently had a rather ornate signature. Thank you, Tom! Those are spot on, not just the signature but the whole inscription. I'm selling this and a Bill Haast signed Cobras in His Garden, both with book and jacket in excellent shape, and a dust cover. The Haast book is on ebay now, the Kauffeld book will be shortly, both starting at $99, if anybody's interested, or if you have an opinion on that price. I bought them 20 years ago; they were expensive but I've forgotten what I paid.